GAINESVILLE, FL – Business leaders and academics focused on internal communications, employee engagement and organizational behavior now have a consolidated source for research-based knowledge as the Institute for Public Relations (IPR) Commission on Organizational Communication launches its free online research center at instituteforpr.org/orgcomm. The site edi tors are Bruce Berger, Ph.D., professor of advertising and public relations at the University of Alabama, and Lan Ye, doctoral student at the University of Alabama. Business leaders and academics can use the site to interact and comment on the research, how they will use it and what further research they would like to see. The growing bank of studies available through the research center cover such topics as measuring employee engagement; the link between leadership style, communicator competence and employee satisfaction; the impact of employee communication and perceived external prestige on organizational identification; and an examination of employee “silence” and the lack of upward communication. In addition to Berger, the members of IPR Commission on Organizational Communication include Keith Burton, President, Insidedge and Executive Vice President, GolinHarris; Gary Grates, Principal, W2O Group; and Maril MacDonald, CEO, Gagen MacDonald. Joining Berger, Burton, Grates and MacDonald on the steering committee for the new research center and future research projects are Lisa Hartenberger, Director, Communications, Navistar; Chris Olson, Assistant Vice President, Corporate Communications, USAA; and Gary Sheffer, Vice President, Corporate Communications & Public Affairs, GE. 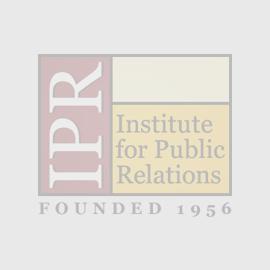 The Institute for Public Relations is an independent foundation dedicated to the science beneath the art of public relations™ and focused on research that is applicable in communications practice. Its research is available free at instituteforpr.org and provides the basis for the organization’s professional conferences and events.